Catholic faith is at the heart of Resurrection, infused in every subject and activity. Because of that faith and the combined effort of the school’s students, parish community, faculty and staff, Resurrection has been chosen for the fourth time as the Catholic Education Foundation’s School of Excellence. Resurrection became a consolidated school in 2007 — a situation that was initially difficult for the community as three schools were combined to unite five parishes. The first step forward was forming a board of directors. 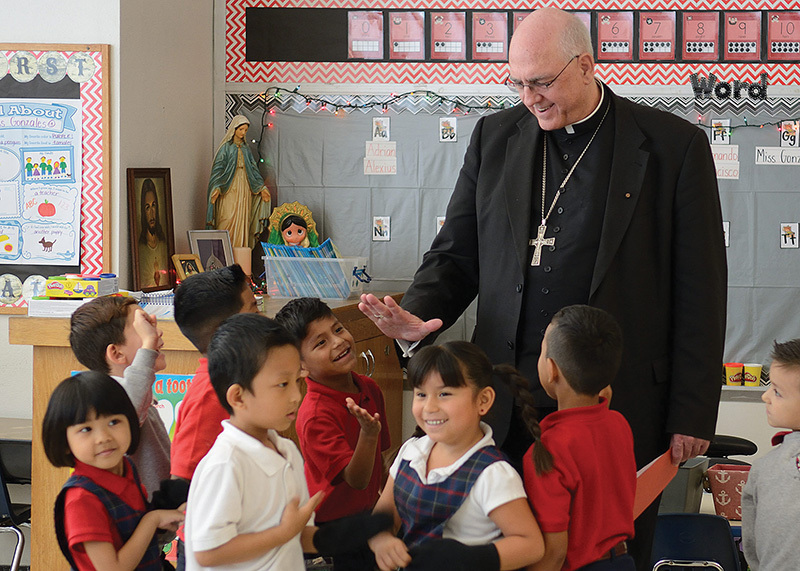 Indeed, over the years, as these parishes have cooperated in supporting their school, enrollment has increased, test scores have improved, and a united, yet wonderfully diverse, community has emerged. With students from Mexico, Croatia and Myanmar/Burma, over half speak a language other than English at home. This amazing diversity is on display during the school’s annual fundraiser, Taste of KCK, which will be held on Jan. 27, 2018. “We bring together all the different ethnic foods that represent our school,” said Higgins. “We have some Hispanic food, Burmese soup, Go Chicken Go, Polish sausage and sauerkraut. Because 76 percent of Resurrection students are eligible for federal free or reduced lunch, CEF scholarships are vital to the success of the school and its students. That success is clear walking the halls of Resurrection and seeing students engaged and working hard in a supportive environment. But there are numbers to prove that success, too. Resurrection’s formula for success seems to be a combination of community support, high academic expectations and, most important, catholicity. Students attend Mass together every Wednesday and pray the rosary together every Friday. During Lent, they pray the Stations of the Cross together.